Small kitchen design is becoming a necessity and whilst we all dream of that sprawling kitchen fit for the most extravagant dinner party, the reality is that many British home-owners simply lack the space required to pull off such a layout, but beautiful design isn’t exclusive medium and large-sized kitchens… Small kitchen design is very much possible! For many urbanites and apartment dwellers, a small kitchen can be the most frustrating part of your living space. The good news is, there are lots of ways to maximise your small kitchen, and make it work for you. 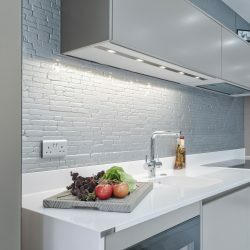 Style doesn’t discriminate against size; all of our hard wearing surfaces and worktops can be cut to any shape, and fitted into almost any space. One of the often understated benefits of a small kitchen is the increased efficiency, and as with any size kitchen the work triangle concept still applies. Smaller appliances can be supplied and installed into these rooms, and many white goods can be hidden inside cabinets, and in the case of microwaves they can often be hung on walls. Another pro tip for small kitchen owners is to utilise your wall space and storage. Once the cabinets are full, (and as you know, it doesn’t take much) where do you put all the things you have left? Counter space is precious, so why not consider hanging shelves on your wall? This can be a great way to add some life and colour to your small kitchen, especially if you have some cute coffee mugs, or antique plates worthy of display. Put up a shelf, and show off your goods! You should also consider hanging your bigger, clunky items, such as pots and pans. This not only frees up space in your cabinets, but it can give a fun, industrial kitchen vibe to your small living space. Untapped space can be utilised by installing islands and breakfast bars, with curved surfaces and under-lighting further increasing real-estate value. With the correct form of lighting any kitchen can be made to appear larger and more inviting. Lighting is also an important factor to incorporate into your small kitchen design. Make the most of any natural light available by not covering any windows with dark, heavy blinds or curtains. If possible do not have anything at the window. To create extra light a good idea is to add under counter and under cabinet lighting. This will not only make the space appear larger but make it easier to use any work spaces that are usually in shadow. Anyone with a small kitchen needs to keep on top of clutter. With far less space available it can be easy to let things stack up on top of counters or pile up in corners. Get rid of anything you do not use and only keep out essential items. Last, but not least, to make the most of your small kitchen design choose furniture that will complement the space. Narrow tables and chairs will function just as well as the chunkier alternatives but will take up far less space. All of these design ideas and more can be worked into our small kitchen designs with relative ease. Why not contact us for help and advice? We’re happy to help!